Kabir Ali took 20 wickets in 14 one-day internationals for England, as well as playing in one Test. 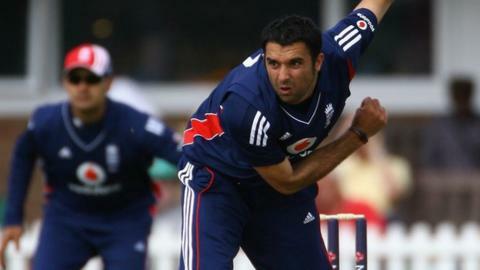 Former England fast bowler Kabir Ali has retired from first-class cricket following a serious shoulder injury. The ex-Worcestershire, Hampshire and Lancashire seamer, 34, has failed to recover from the injury suffered in the T20 Blast semi-final win over Hampshire at Edgbaston in August. Released by Lancashire in October, he had hoped an operation might work. "I underwent major surgery and did all the rehab but, when I tried to bowl, I struggled to get any pace," Kabir said. "I have had a couple of major injuries before and come back from them. And I had the same positive mindset. "It almost shattered me because, deep down, I knew something was not quite right in the shoulder. "I went out to Barbados hoping the hot conditions might help the process as a last resort. "Doctors have suggested I need further surgery and that is a one-year rehab process. On that basis, it would be unfair to push myself to other counties." A cousin of England's Moeen and his elder brother Kadeer, Kabir made his debut for Worcestershire in 1999 and spent 11 years at New Road. He played one Test for England (at Headingley against South Africa in 2003), taking five wickets - but he was not picked again after being told he was not fast enough. After leaving New Road in 2010, he played for Hampshire for two seasons, helping them to win the CB40 title in his final appearance at Lord's in 2012, before joining Lancashire. He also played for Rajasthan Royals and Barisal Burners in the Bangladesh Premier League. He claimed 500 first-class wickets in his career, taking 23 five-wicket hauls and claiming 10 wickets in a match four times. Kabir's only Test appearance came against South Africa at Headingley in 2003 but he played in 14 one-day internationals taking 20 wickets at an average of 34.10. "I would have liked to have played more cricket but that is water under the bridge now. I am looking forward to moving on and teaching youngsters," he added. "I would have been known as one of the best death bowlers on the circuit and I am very proud of that fact because I worked very hard on one-day cricket."